FFF Week (TM) is underway!!! New York, NY (May, 01 2010)- Plus-size fashion continues to be hotly debated, and helping to lead this charge is a dynamic group of the plus size community’s leading fashion bloggers- The Curvy Collective. 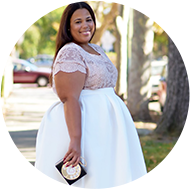 Created to capture, expose, and share up-to-the-minute news for Full Figured Fashion Week ™, The Curvy Collective fashions a network of bloggers to leverage their blogs and social media platforms to facilitate the latest news. Curvy Collective co-founders, Marie Leggette of The Curvy Fashionista and Johara Tucker, of Luvin’ My Curves, launched the collective last Spring of 2009 with the inception of Full Figured Fashion Week ™. Back for a second year, the leading plus size fashion blogs joining the Curvy Collective include: The Curvy Fashionista, Luvin’ My Curves, A Curvy Girl’s Guide to Style, Diary of a Mad Fashionista, Fatshionista , Full Figure Plus, Life Size Radio, Musings of a Fatshionista, Madison Plus, The Big Girl Blog, Stylish Maven, and Daily Venus Divas. The Curvy Collective will also facilitate a Full Figured Fashion Week™ panel discussion: “The State of the Curvy Community” being held at Hotel Penn on Friday, June 18th, from 4 –6:00PM. Moderated by Sharon Quinn, panelists will address the climate of plus size in the media, the progress, challenges, and successes of the curvy community. For all press inquiries please regarding The Curvy Collective, please contact press@fffweek.com . For more information on Full Figured Fashion Week, please visit their official website at Full Figured Fashion Week ™. Hey lady! Thanks for the info! cross posted with a link back to your blog!